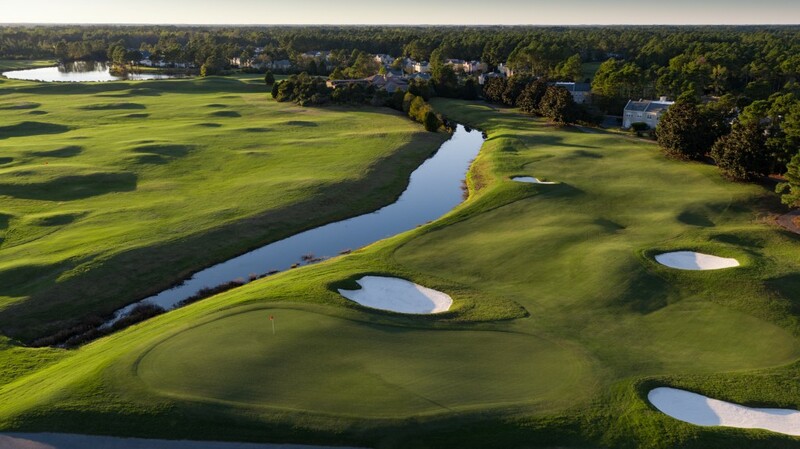 Legends Golf Resort is home to three of Myrtle Beach’s most popular tracks with its Moorland, Heathland and Parkland designs. For years, these courses have been favorites among visiting golfers. The Parkland Course is not only one of the Grand Strand’s most requested and frequently played, but also received 4 stars from Golf Digest’s Best Places to Play in 2009. This layout can be challenging for even the most skilled golfers, with more than 100 bunkers strategically placed by designer Larry Young. A par 72 layout, the Parkland Course features a number of memorable holes, including the par 4 9th. No. 9 features a dogleg right and plays 317 yards from the blue tees and 308 from the whites, so it’s definitely reachable for long hitters. You can play the hole straight and go for the green, but water lurks on the right – so watch out! There are six bunkers, including four in the fairway, but the sandy canyon that fronts the green MUST be avoided. The monster of the bunkers is one that is 20-30 feet deep in front of the green. There are many ways to challenge the hole, but none are as simple (or easy) as the yardage suggests. You can play conservatively – iron off the tee and wedge in – and it’s fairly simple. But most golfers have a gambling streak in them. We couldn’t agree more, and hope you have the opportunity to play the Parkland Course during your next golf trip. Want to explore more Myrtle Beach golf courses? Click here or let one of our golf specialists help you by calling 800.422.1587. This entry was posted in Myrtle Beach Golf and tagged booking Myrtle Beach golf packages, Myrtle Beach Fall Golf Packages, Myrtle Beach Golf, myrtle beach golf clubs, myrtle beach golf courses. Bookmark the permalink.